If you’re reading this article, then you’re either curious about why thalis are such an important part of our daily meals or you’re looking for the best place to find a giant plate of goodness. Whatever the reason may be, thalis are a great meal. The perfect lunch, at reasonable prices. One of the reasons why thalis are so popular is because you get a solid meal and then some, for a good price. Like any good South Indian restaurant, Krishnavillasam has a menu filled with food options from around the South, but also the North and some Chinese dishes. But for their special thalis (or saapadu as they call it), you can choose from the four options they have. 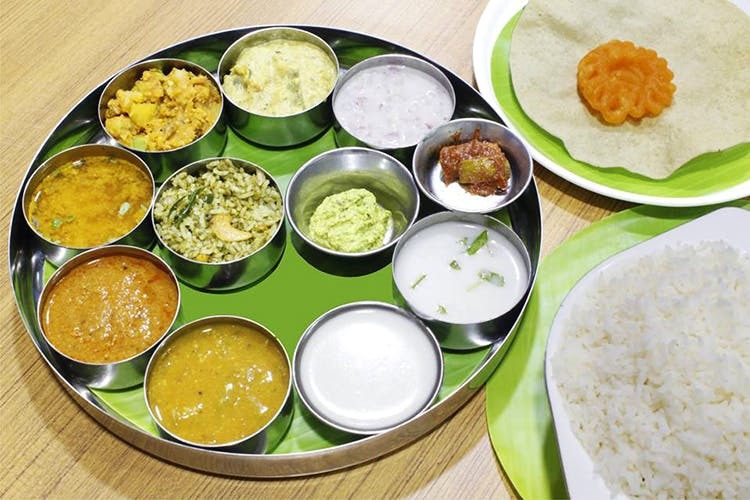 They have a special Krishnavillasam Saapadu which has a standard format featuring soup or welcome drink, steamed rice, special kuzhambu, sambar, rasam, curd, pickle, appalam, butter chilli, a variety of curries and a dessert. However, the great thing about this saapadu is that the dishes are not always the same every day. But what you can be sure of is that every dish infuses the flavours of the Thirunelveli-Thrissur area. Please note that these meals are only available in the afternoon, till 3.30pm. You might know this already, but Saravana Bhavan has restaurants all over the world – including the US, Canada, and the UK. So you know that they’ve had years and more than enough time to perfect their delicious thalis. Their food is quite well known around the city and even the country, but here’s the best part – they have a special limited meal offer going on till the end of this year! The offer features four different kinds of thalis (with chapatti and rice, with a glass of juice and the works) and up to almost 18 different varieties of side dishes to enjoy with your meal. In the Limited Meals, you will be served rice, poriyal, koottu, sambar, rasam, special rice (during lunch), special kuzhambu, appalam, thuvaiyal, butter milk, and pickles. While Special Limited Meals comes with all of the above but also with curd, pachadi, and a sweet dish. The meals range from INR 75 to INR 150, so head over right now. If you’ve never tried a Gujarati thali before – or Gujarati food, for that matter – then this is your chance! At Amdavadi, the thali changes certain elements depending on the day of the week. These daily unlimited thalis have a few common dishes like the green salad, dabeli, lime ginger juice or chaas, papad and roti or puri, but each day has a different selection of other items including khaman dhokla, bharalo bhindo and masala khichdi (on Mondays), methi gotha, rice and turdal, gajar halwa, khatta dhokla (on Tuesdays). Having been around for a while now, Vrindavan is a name that everybody already knows. Located on the ground floor of New Woodlands Hotel, this vegetarian restaurant starts off with breakfast and they are always packed till they close after dinner. And depending on the mood you’re in, you can choose from their thali options. The South Indian lunch is a classic and has items like poori, sambar, rasam, dal, a special kuzhambu, rice, appalam, pickle, curd and two regularly changed vegetable curries, payasam, and ice cream. But if you’re looking for something more from your lunch, go with the Maharaja Thali, which is much more extensive with a welcome drink, soup, roti, paneer tikka, rice, papad and a selection of vegetable curries made in North and South Indian style, a sweet dish and fruit salad with ice cream.